I've started mesuring the power usage of the most power hungry electronics and appliances I own. I bought a Kill-A-Watt which can be used to measure how much energy an electric device uses par month. It's pretty cheap (30$) and I think it's worth it considering the saving you can make on the long term by finding your most power-hungry appliance and turn them off. I'm doing this not necessarly because I want to save the environment from global warming, but because I like to be efficient in the way I do things. I'm posting the data that I have gather yet. I will update regularly as I gather the remaining data. 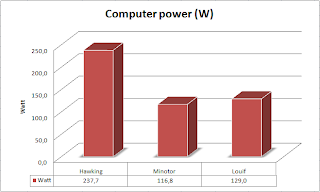 Hawking has a AMD X2 4000+, Asus M2N-E, Geforce 8800 GTS 320 MB, 2x 320GB hard drives, 4GB RAM. Minotor has a AMD Sempron 3000+, Asrock Sis 760GX, Radeon 9700 Pro 128MB, 2x hard drives, 1GB RAM. Louif has a AMD Athlon64 3700+, Asus A8N-E, Rage II+DVD 2 MB, 1 hard drive, 2GB RAM. I think that I saw a wireless Kill-a-watt monitor that could do multiple outlets. This could show you how two compare at the same time!